WASHINGTON — President Trump said Thursday night that the United States had carried out a missile strike in Syria on Thursday night in response to the Syrian government’s chemical weapons attack this week that killed more than 80 civilians. A senior military official said that 59 Tomahawk cruise missiles had hit Al Shayrat airfield in Syria. The missiles were aimed at Syrian fighter jets and other infrastructure but did not target anything that may have had chemical weapons. He said that no Russian planes were at the airfield and that the cruise missiles did not target any Russian facilities. The Pentagon informed Russian military officials, through its established deconfliction channel, of the strike before the launching of the missiles, the official said, with American officials knowing when they did that that Russian authorities may well have alerted the Assad regime. “With a lot of Tomahawks flying, we didn’t want to hit any Russian planes,” he said. The cruise missiles struck the airfield beginning around 8:30 p.m. Eastern Time on Thursday and the strikes continued for three to four minutes. According to one military official, the Tomahawks were launched from two Navy warships. The official said that the cruise missile strike was at the more limited end of the military options presented to President Trump Thursday by Defense Secretary Jim Mattis. The cruise missile strike, the official said, was intended to send a message to Mr. Assad about the American intention to use military force if he continues to use chemical weapons. It was the first time that the White House had ordered military action against forces loyal to Mr. Assad. The speed with which the Trump administration responded — and remarks earlier in the day by American officials who said that options were still being considered — appeared intended to maximize the element of surprise and sharply contrasted with the methodical scrutiny of the use of force by the Obama administration. It was Mr. Trump’s first order to the military for the use of force — other operations in Syria, Yemen and Iraq had been carried out under authorization delegated to his commanders — and appeared intended to send a message to North Korea, Iran and other potential adversaries that the new commander in chief was prepared to act, and sometimes on short notice. The airstrikes were carried out less than an hour after the president concluded a dinner with Xi Jinping, the president of China, at his estate in Mar-a-Lago in Florida, sending an unmistakably aggressive message about Mr. Trump’s willingness to use the military power at his disposal. Unlike Mr. Obama, who weighed — and ultimately rejected — the use of a similar strike at targets after Syria used chemical weapons in 2013, Mr. Trump moved with remarkable speed, delivering the punishing military strike barely 72 hours after the devastating chemical attack that killed 80 people this week. Only Congress has the power to authorize war, under Article I of the Constitution. There has been no declaration of war against the Assad regime. Yet we just bombed their military base and perhaps killed a few Russians in the mix. This is scary. I see that Bashir has to be stopped, but oh could this spark another war? It says no Russians have been killed. magica wrote: This is scary. I see that Bashir has to be stopped, but oh could this spark another war? I'm of the opinion right now that this was cooked up by Trump and his Russian buddies, to provide a major distraction away from the investigation into Republican-Russian coziness. Something had to be done. Call it Operation Pot-Hole Production...because the ordinance cost more than the repairs will. All the Navy has done is toss a lot of fireworks onto a runway, blowing up a few feet of blacktop. You see Trump talking tough. Putin is wringing his hands and saying, "I fear that with these approaches the hoped-for U.S.-Russian anti-terrorism coalition in Syria ... is breathing its last before it is even born." We burned a couple of babies, but WTF...it's war, right? Then when the lovers reconnect, and the world breaths a sigh of relief, the breathless imoratas will demonstrate their rediscovered love by removing the sanctions on Russia over Ukraine. Cute eh? Russia doesn't give a shite about Syria...all it is, is a Mediterranean seaport for them. They side with Assad because he is an easier puppet than the Iranian Ayatollahs, and Russia needs to ship their oil (when they get to it) from someplace. It's all a game, and Trump is just another marionette. Operation Pot-Hole Production is just a sideshow, with no downside, and the possibility of a big win for Putin: freeing his Rosneft Oil. It is a plot created by poets...it even smells Russian. Im not good on Politics Quill, but I must admit I smelled a rat. It will be good to see the outcome of this and if you are right, which I hope so. I don't think anyone needs another world war, the last one was enough for us. Now watch the isis/rebels start to let off more sarin on innocent people, to then claim it was govt forces to provoke more US missle strikes on the govt! Sadly you could be right Tommy. Oh what a mess it is. Suppose you are right. If the Syrians stopped flying their aircraft, we could prove one way or the other if it was them. If the flying stops, and then the gassing stops...bingo. Sadly my uniform no longer fits and I'm permitted to fly nothing bigger or more aggressive than a DH Chipmunk...so you'll excuse me if I sit this one out. In any case, my Arabic is limited to "sod off, you little scrote." Er no - nobody else is going to use gas if they know that the Syrian planes aren't flying, and they will know that. You hope it was cooked up by Trump and Putin. If it wasn't, Putin isn't going to like the Americans interfering in his aims and extending the war which is already going on. He might even retaliate. I think the strike was very premature. It has not yet been proved that it was Assad who is responsible for the gas. I'd like to hear what the other anti-Trump people feel about this. Do you think it was the right thing to do? Yes, we need to watch closely the signs. Putin's response is important to showing whether this was collusive. But let's take stock: 1) no real harm was done to Assad's forces; 2) no harm was done to Russia at all; and 3) Putin's alliance with Assad is one of convenience, after all. I'm thinking, Putin's response should be: What's to complain about?? Don't get all impressed by loud explosions and lots of military hardware. Keep in mind that Trump is a big one for SHOW. His attempts at real policy have fallen flat on his face. The Courts have shot down his Muslim ban. And Congress shot down his Trumpcare health plan. His last attempt at a military SHOW ended in failure, as the raid in Yemen killed a Seal and numerous civilians...and crashed an Osprey. The time is ripe for one more try to look presidential...especially if it costs nothing. Putin would go along with this show because he wants the sanctions lifted. A popular Trump is an effective Trump, and an effective Trump could lift the Russian sanctions. So let Trump have his little show, and let's see if he doesn't get closer to the brass ring. Perfect. No gas, no bombs. Now we've solved the Syrian crisis. Good theory, but not really because then the rebels would be more equally matched, and so would ISIS, so it would go on and on. Also, there are still Russian planes. I do agree with you Quill that the whole thing is a bit odd. Why would Assad release gas? He was making progress against the rebels. Why would he do something which was bound to cause huge concern and risk military action against him? He would know that would weaken him and give the rebels more credence. The speed at which Trump reacted is odd too. He seems like an impetuous person, but even so, that was absurdly premature. Raggamuffin wrote: I do agree with you Quill that the whole thing is a bit odd. Why would Assad release gas? He was making progress against the rebels. Why would he do something which was bound to cause huge concern and risk military action against him? He would know that would weaken him and give the rebels more credence. Maybe he suddenly turned mad and decided to gas people? He has already been known to target civilians with the use of chemical weapons. Assad knows he is propped up by the Russians, and many are too scared to confront the Russians. That is why Assad thinks he can do as he pleases. He would know what the reaction from around the world would be - he'd already been in trouble before. He was making progress - why risk that by using gas? He has already got away with gassing people before. So how would he be in trouble, since he has never faced any accountability for his crimes? How has he made progress, with 9 million displaced, near half a million dead and no sign of the end of the civil war? He was making progress in Aleppo. No, I'm really not sure about this gas attack. I've already said it's possible that it didn't come from him. They're doing tests apparently to clarify what it was and to try to establish where it came from. Raggamuffin wrote: He was making progress in Aleppo. So progress in one town? Your belief that people starving to death and bombed to kingdom come is progress? Yes, we already know you make apologist defense of genocidal murderers. Its up to you to disbelieve this, when the evidence all points to a chemical attack. You're on ignore Didge. I'll wait for someone with more intelligence to comment. I'm quite surprised at the lack of response on this thread generally. Raggamuffin wrote: You're on ignore Didge. I'll wait for someone with more intelligence to comment. I'm quite surprised at the lack of response on this thread generally. Excellent, another brainless dummy runs away, when made to look very silly. Tubbymuffins claims she is the standard to set intelligence too. 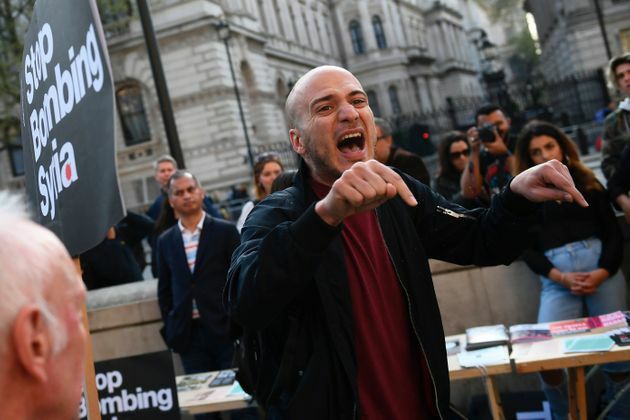 An enraged Syrian refugee accused Stop The War of trying to silence him as they protested outside Downing Street against Donald Trump’s air strike. Hassan Akkad went to the quickly arranged gathering on Friday and said he was appalled by the absence of “a single placard or slogan” condemning Syrian dictator Bashar al-Assad. He said he shouted “that Assad is our enemy”, saying they would not let him address the crowd on their megaphone. Trump ordered the missile strike against an Assad regime airbase after a nerve gas attack on Tuesday killed scores of civilians, including more than 30 children. Stop The War has been accused of double standards for vocally opposing Western intervention in the Syrian civil war but being silent on Russian intervention, which propped up Assad, as well as the regime’s crimes. The Russian representative, along with the Syrian and Libyan ambassadors, argued that America's unilateral military intervention defied the UN charter and violated international law. The US, they said, had not acted in self-defence and had not sought the agreement of the Security Council, the UN body tasked with maintaining global peace and stability. Russia said the White House had "completely ruined" the relationship between the two countries. So what was the purpose of the air strike? Was it really to take out remaining supplies of chemical weapons? I don't think so. It was to warn Assad, and it was retaliation for the gas - even though it's not been established where it came from. If the US threatens more action, won't the Russians be prepared to defend their ally and themselves, and possibly attack the American warships in the area? It doesn't help that the US has been accused of killing civilians in an airstrike a few weeks ago, including children. As usual, Labour party MPs are split on this. Corbyn condemned the airstrike by the US, and some Labour MPs are up in arms about that. Meanwhile, Tim Farron appears to be suggesting that we should perhaps join in with the US in possible future airstrikes. I think there is good reason to have trepidation and doubt. As yet, there is no CONCLUSIVE proof, just strong suspicion. Not enough to go to war on. And we all know where the claim that Saddam had WMD lead to. Angry Andy wrote: I think there is good reason to have trepidation and doubt. As yet, there is no CONCLUSIVE proof, just strong suspicion. Exactly Andy. If it turns out that Assad wasn't responsible, Trump won't have a leg to stand on. I think that whatever is done, or not done, there will be a problem. Assad will be weakened if the US goes after him, the rebels and ISIS will be in a stronger position, and may well take back the areas which Assad has made military progress in, and take even more. If there are chemicals over there, they will be up for grabs, and we don't want ISIS or other groups getting hold of them. What scares me most is the predictability of this all. Before he was elected, many warned that Trump was a loose cannon itching for a war. 120 days into his presidency he is now on the brink of 2 wars in different parts of the globe, the middle east and Korea. They are gonna be very costly, both in loss of life and the price of ordnance. Seems his wishes are coming true. So it seems some want the west to bow down to bully dictatorships like Putin's Russia. I don't think anyone expected the post mortems to say any different - it's quite clear that some kind of chemical was involved. The question is - where did it come from? The Russian president attacked “groundless accusations” that Damascus was responsible for the assault, and called for a “detailed and unbiased investigation” into the deaths, a Kremlin statement said. Russia’s defence ministry has argued that Syrian planes were destroying chemical weapons, not deploying them, and said the airstrikes targeted a rebel storage depot for toxins. That claim has been widely dismissed as implausible by experts. Who are these experts who dismissed the claim, and on what grounds? The Russians are right in that it's not enough merely to confirm that chemicals were used, and those who think Assad used them need to be more specific as why think it's impossible that there's another explanation. We have been over the false claim it was destroying chemical weapons stored. They would have been destroyed in such an attack. Even Lord Foul admitted as much. This is the typical mentality throughout this conflict. It started by people rising up for democracy and led to the displacement of 9 million people, half a million dead, countless wounded, whilst the world sat by and watched. Through the most absurd view, that to get involved would cause more terrorist extremism. Where instead because of the refugee crisis. Populist Right wing parties have exploited the refugee crisis through fear to gain more seats and control. This is where inaction has led to. An international team has concluded that the Assad regime and Islamic Statemilitants carried out chemical attacks in Syria during 2014 and 2015. The team from the UN and the Organisation for the Prohibition of Chemical Weapons (OPCW) accused the Syrian government of using chlorine gas in two attacks and Isis fighters of using mustard gas in one. The UN security council established a joint UN-OPCW investigative team a year ago to identify those responsible for chemical attacks in Syria, and it examined nine cases in seven towns where chemical weapons were believed to have been used. I don't believe that chemicals would necessarily have been destroyed. It's not enough to say they would have been destroyed - it needs to be proved that the hit on the building was enough to totally destroy any chemicals being stored in there. The problem is that it's not just the Government fighting one group - there are loads of groups there, and I don't believe that if Assad was toppled, there would be peace - all the groups would be vying for power. “From 11.30am to 12.30pm local time, [9.30am to 10.30am BST] Syrian aircraft conducted an air strike in the eastern outskirts of Khan Sheikhoun on a large warehouse of ammunition of terrorists and the mass of military equipment,” said Major General Igor Konashenkov, according to a translation by Russian state media. But witnesses and survivors said the bombs struck hours earlier, with images showing at least one hit a road rather than a building. Hasan Haj Ali, commander of the Free Idlib Army rebel group, called the Russian statement blaming the rebels a “lie” and said rebels did not have the capability to produce nerve gas. “Everyone saw the plane while it was bombing with gas,” he said. 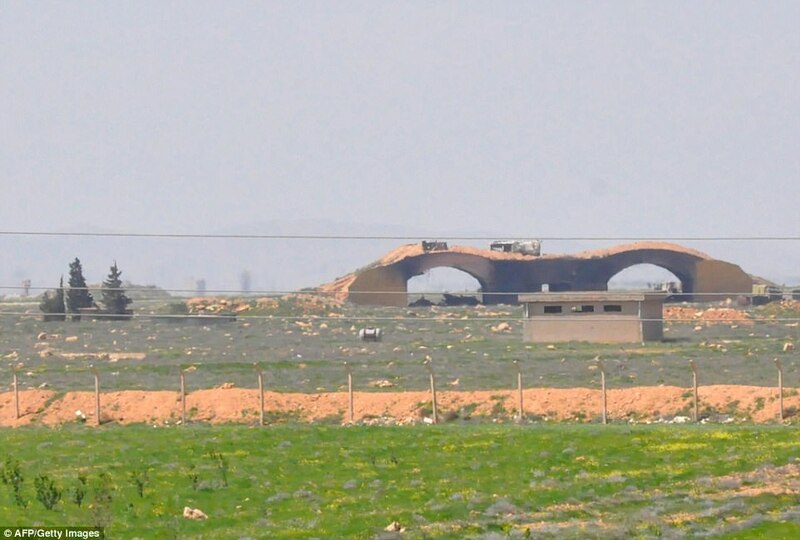 While Isis is known to have used mustard gas, the area around Khan Sheikhoun is controlled by a range of opposition factions including Islamists and groups linked to al-Qaeda. Russia accused fighters of deploying chlorine gas in Aleppo but no evidence to support the allegations has been put forward by international agencies, who believe that sarin was deployed in Tuesday’s attack. Beyza Unal, a research fellow with the International Security Department at Chatham House, said the banned nerve agent is expensive and difficult to purify and store. “Something that needs a certain level of expertise and also money,” she told The Independent, saying any facility would need the ability to take oxygen out of the area where sarin is stored. “I don’t think rebel groups would have the ability governments would have to purify nerve agents to a level that would make them stable,” Dr Unal added. She added that images of bomb craters in Khan Sheikhoun indicated small payloads, rather than explosives of the type typically used to destroy an entire building. Sarin can be fatal when either inhaled or absorbed through the skin, contaminating water and clothing to affect anyone coming into contact with symptoms including blurred vision, choking, nausea, weakness, convulsions, paralysis and respiratory failure. Critics of the strikes have raced to attack the US for blaming Assad, dismissing physical evidence against him and arguing that it would be irrational for the Syrian leader to use chemical weapons. Russia and Syria have claimed the sarin came from rebel stockpiles hit accidentally by government bombs, an argument dismissed by chemical weapons experts and inconsistent with evidence at the site of the attack. “Assad is not mad and would have known that when Donald Trump produced an olive branch in his direction [then] any use of chemical weapons would have been counter-productive,” said Peter Ford, a former British ambassador to Syria. But Assad’s military gains since 2015 have been slow and costly. His army is battle-weary and although they have won decisive battles, the war is far from over. Joshua Landis, a long-time Syria observer and director of the Center for Middle East Studies at the University of Oklahoma, said chemical weapons could be attractive to a leader running low on military alternatives. “I think Assad and his generals want to win and have a depleted and exhausted army,” Joshua Landis said, when asked on Twitter if he thought the Syrian leader would have used chemical weapons. The images of the sarin victims, many of them children, are disturbing. But over the course of the long war Assad’s government has shown little compunction about civilian suffering and death. There have been atrocities documented by all parties in the conflict, but Assad is responsible for the majority of civilian deaths. And from the chemical weapons attack of 2013 to the bombing of hospitals in Aleppo last year, Syria has repeatedly broken international laws protecting non-combatants. As early as 2013, UN officials said the Syrian leader was implicated in war crimes. Survivors and defectors have documented a gruesome archipelago of torture and murder chambers in jails and hospitals under the control of Damascus. Assad has also bombed and starved civilians in rebel-held areas for years. It was a brutal wager, which until this week paid off, that Russian support and western fear of intervention would protect him from anything more damaging than censure and outrage. So have the experts said that it was definitely sarin? Raggamuffin wrote: So have the experts said that it was definitely sarin? Even experts who say it is too early to confirm sarin use say the deaths have all the hallmarks of a chemical weapons attack, delivered through airstrikes. “It is possible it’s sarin but also possible it could be something else, or a mix of things. We mustn’t fall into the trap of thinking that [only] one substance was used, when it could have been more than one,” said Richard Guthrie, a British chemical weapons expert. 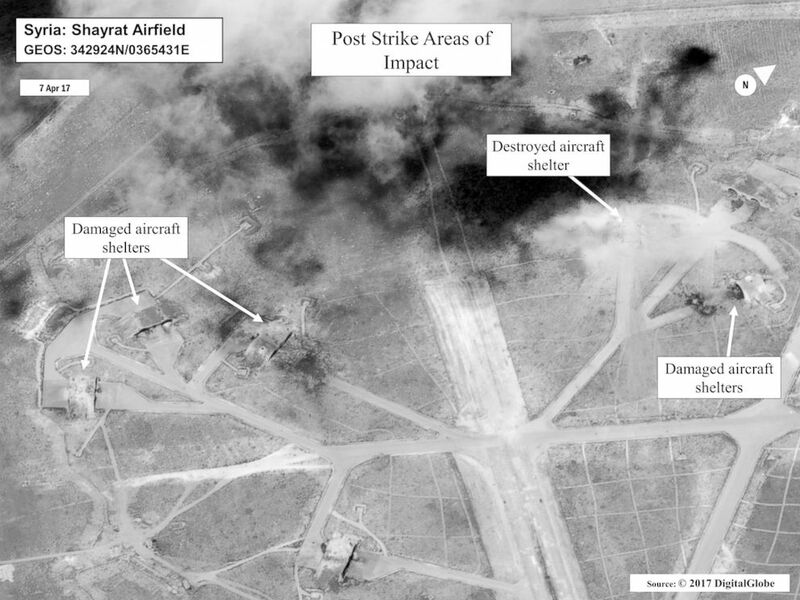 Syria’s military has “categorically denied” responsibility for the attack. Russia, which is heavily backing the Assad government, said a Syrian government airstrike had hit a “terrorist warehouse” holding “toxic substances”. That claim does not fit with facts on the ground, for several reasons. An airstrike on a weapons depot with high explosives would have destroyed much of the sarin immediately, and distributed any that survived over a much smaller area. “The pattern of casualties isn’t right for the distribution of materials that you would get if you had a location with toxic materials breached by an airstrike. It’s more consistent with canisters that have distributed [chemical weapons] over a wider population,” Guthrie said. Seems like the Cruise missile strikes were ineffective. Whatever the truth is, Putin seems determined to stand by Assad - at least for now. How does that leave things? Is he likely to ever concede that it could have been Assad who did the deed? If not, then there's no point in the US doing anything more. If they carry on using military force against Assad, the Russians may well retaliate because they are also in the area and they have their own agenda. Raggamuffin wrote: Whatever the truth is, Putin seems determined to stand by Assad - at least for now. So back to situation as normal and the continuation of a flood of refugees, thousands dying and injured. Its time the west stood up to Putin, as he could not possible hope to match the west's armed forces. I think most is bluff by Putin at the end of the day. Nobody wants a global war and its the fear of this that Putin plays off. He is as unlikely to seek war with the west, as they are with him. So he uses this fact to throw his weight around. The Daily Express takes the view that things could escalate quite badly. DONALD Trump’s missile attack on Syria has raised fears it is the opening salvo in a war between the world’s two biggest military powers. Concerns over the escalation were heightened further last night when Russian President Vladimir Putin ordered a warship in “full combat readiness” to sail to Syria to help protect it against “US aggression”. Meanwhile, the US is allegedly investigating whether the Russians had any role in the incident. The US is investigating whether Russia was involved in the chemical attack in Syria that prompted ********* Donald Trump to launch the first direct military assault against the Assad regime. The Pentagon is looking for any evidence that the Russian government knew about or was complicit in the attack in Idlib province that killed at least 80 people and injured dozens more, a senior US defense official said. The US military official said the Pentagon was examining specifically whether a Russian warplane had bombed a hospital in Khan Sheikhoun five hours after the initial chemical attack, with the aim of destroying evidence. A US defense official says intelligence shows a Russian drone flew over the hospital in Idlib that was treating victims of the chemical attack, prior to the site being later bombed by an unknown aircraft. Assad already has superior military force and is winning... and has the hostile eyes of many other nations on him, ready to condemn him for any wrong move... so why would he be using chemical weapons...!? That's what I think too Tommy. I can't see why he would risk more hostility from other nations. I don't enough about Sarin yet, and it's not even been confirmed that it was sarin. There are other chemicals that can cause similar symptoms and death. The terrorists in Tokyo released sarin on the Subway in 1995. It was a small amount, but where they did they get hold of it? I'm reading all kinds of conspiracy theories about the alleged attack - interesting stuff. Is it possible that if it is sarin, it didn't come from a Syrian plane or the building which was attacked? How much would be needed to affect that many people out in the open? Also, why are the rescuers not affected by it? Some of them are touching people who have been exposed to the substance with bare hands.